Notation: Aeroturbopower weighs in on the controversy with his usual data-driven analysis. With the commencement of the advertising battle between Boeing and Airbus, it is useful to make some additional comparisons prepared by AirInsight. Here is the offending Boeing ad that set off the ad wars. It’s a two-page spread and sorry, we couldn’t scan it into one advert. Click each image to englarge. The 747-8I and A380 are quite different aircraft, and while some view them as direct competitors, they are more properly lone players in different segments of the VLA market. Nonetheless, an airline will likely evaluate both aircraft as it maps its growth strategy, and two carriers, Lufthansa and Korean Air, have chosen to fly both aircraft types for different route structures. Each of those airlines have indicated that the 747-8I fills a gap between their 300 seat aircraft and 525 seat A380 aircraft, and will deploy the aircraft appropriately to traffic demand and traffic growth in different markets. While the two aircraft are quite different, they are still compared to each other and both aircraft mile and seat mile economics. Of course, in comparing these aircraft, seating configurations make quite a difference, and the two aircraft manufacturers utilize markedly different assumptions in that regard. Boeing indicates that standard 3-class seating configuration for its 747-8I is 467 seats, but Lufthansa is currently using 362 in its aircraft, compared with 334 in a 747-400, and 526 for its A380. Each of these layouts is oriented heavily towards premium class seating, an essential element for many carriers these days. The Boeing layout for the 747-8I shows 467 seats configured in a layout that has somewhat tight seat pitch in business class and does not accommodate today’s sleeper seats. The Boeing configuration offers 26 first class seats at 61” pitch, 89 business class seats at 39” pitch, and 352 economy seats at 32” pitch. However, those pitch standards, from the 1980s, are more equivalent to business, premium economy and economy rather than first, business and economy. Boeing also computes a 555 seat capacity for A380, using similar pitch, except for 48” rather than 39” in business for their seating standard. Airbus, by contrast, utilizes more realistic three-class standards of 81” first class, 61” business class for sleeper seats, and 32” for economy passengers, yielding a capacity of 525 on the A380. If these standards, which are more reflective of today’s capacity, are applied to the 747-8I, the passenger count would drop to 405 seats. Each says their airplane is better than the other in various metrics, but in our view there is a fair amount of apples and orange comparison going on. While both aircraft fall within the VLA market segment, in reality they serve somewhat different market segments—and at one time, Boeing conceded the point. The A380 nominally carries 525 passengers in three classes. The 747-8I nominally carries 467 passengers in three classes, 60 fewer. Traffic requirements mean the airplanes will serve somewhat different airline missions. There is room for both airplanes, although we believe the need for the 748-8I is in our view less than for the larger A380. An analogy may be drawn to the single-aisle market segment. The A321 seats 189 in two classes and the 737-700 seats 125, a difference of 64 seats. The two aircraft serve different missions. Comparing these two in fuel burn, seat-mile cost and other metrics makes as little sense as comparing the differently-sized VLAs. If the 747-8I and the A380 were the same size, the comparisons would have meaning. But they aren’t and they don’t. The actual seating configuration of the A380 and the 747-8I varies widely from manufacturer advertisements. Lufthansa configured its A380 with 526 seats vs. Airbus’ assumed 525. Lufthansa, at this writing the only operator of the 747-8I, configured its 747-8I with fewer than 400 seats (technically taking it out of the VLA category) vs 467 assumed by Boeing. Korean Air Lines configured its A380 with 405 seats, barely within the VLA market. It has not yet received the 747-8I it has on order. The Airbus A380, the highest capacity passenger aircraft in the world, takes advantage of this feature to generate the lowest seat-mile economics in the class. However, cost per aircraft mile is lower with the 747-8I. In examining between these two aircraft, the key determinant will be traffic – if you can fill the A380, it will provide higher profits, but if you cannot, the 747-8I could be a viable alternative. 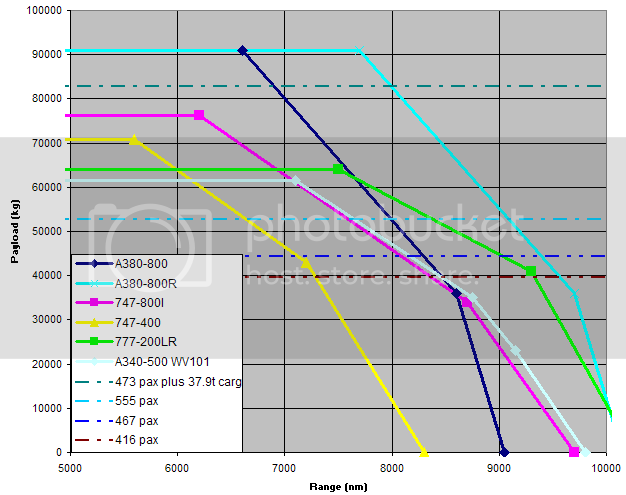 I guess the A350-1000XWB is much better than the A380 in term of seat-mile cost. 1. Per trip fuel and per seat fuel burn of the A380 and 747-8 Intercontinental at its respective nominal full passenger load and on a notional 6,000 nm route? 2. Operating weight per seat of the A380 and 747-8 Intercontinental? The numbers above are interesting indicators without even going into more detail. AirInsight has done a full economic analysis. Data will be forthcoming soon. Looking at the add it would be interesting to compared total payload. Boeing is using 30% more Cargo, but then details it to be 30% more cargovolume. What about payload? Space isn’t the Issue when you take off from a hot Asian airport for a US / European destination. Could AirInsight add e.g a flight from SIN to LHR, or HKG to LAX under respresentative conditions, with 450 passengers on board, how much payload (lbs, not volume) is left for Cargo? Scott wrote “lowest seat-mile economics in the class”. And I guess class refers to VLA. An A320 has lower seat-mile cost than a B787. But kind of tricky to jump over the Pacific using an A320. I still don’t get why Boeing do such ads, which no airline able to purchase such aircraft will take serious. I think people involved in fleet planning decisions are able to differantiate between trip cost, cost per seat, cargo capability and the crucial influence of seating layout (and also the crucial influence of the local market … low seat-mile cost don’t really save the day if the seat is empty). So, in my opinion a pointless ad. Placing missinformation works and is cheap. ( We’d not have had an Iraq conquest without ). Purchasing at whatever level does not follow the fully and objectively informed market participants model. Don’t get mislead by partisan participants playing this down on a regular basis. Good reporting. It amazes me a skilled respected company like Boeing determines this is the right communication strategy. How about preserving Brand credibility. The airlines see these adds too. Does anyone have the numbers on cabin floor space of both aircraft? I guess some people forgot the “4-engines are safer than 2-engines” advert Airbus came out with. Regarding the B748i versus A380-I have to disagree a little with Scott’s commentary. BA absolutely pitted the B748i versus A380 in a “winner takes all” battle. If my sources are correct, it was a very close race between the two with Boeing/GE in front until the last week/couple of weeks when Airbus/Rolls pulled off a fantastic finish. The problem with the B748i is that its “sandwiched” between the A380 on the top end and the ever-improving B77W on the bottom end. Once the B77X numbers are finalized, it will basically mean the end of the B748i. Fortunately for Boeing, the B748F will “live on” at least for a while. The difference with Airbus 4 are better than 2 media campaign that Richard Branson also latched onto & had plastered along his fuselages although not executed very well it was a tad alarmist, it was then & remains now a statement of fact. So, Phil, if unfamiliar with it, you’ll no doubt empathise with that old gag about Captain Speaking asking his flight-engineer(!) to “Feather No 4, please” and getting the enquiring response: “On which side, sir?” But would four engines have helped the BA 777, er, short landing at LHR? Fact of the matter it was started by Airbus. I do think this add is so unprecedented, maybe we forget..
About the 4 engines for long haul Boeing folks continue to drag in long after its expiration date, the same folks forget to mention Airbus pioneered big twins, 8 yrs before the 767 came on and the A330 also went into operation some yrs before the 777 did. Not only did the A340 stop seling yrs ago, the competing 777-200 versions too. Details I guess.. Regarding what Airbus has pioneered is rather irrelevant. What they have stated is what they have stated. My point is it goes both ways. If your “sources” are correct. What “sources” may they be? If you head over to aircraft-commerce (subscription required) and look at their VLA real world airline operation numbers, you would see the A380 bests the 747-8 in almost all regards. Further, what little sales in the category there have been, over 3/4 are for the A380 (the 77W outsold the A346 by a similar margin, and few people deny it’s overall superiority). The cargo holds total about 500 ft3 more volume in the A-380-800 than the B-747-8I, giving the A-380 about 15% more volume. However, more of the cargo hold is used on the A-380 for pax baggage than on the B-747. Even though the MTOW between the 2 is some 223,000 lbs, there is only about a 30,000 lbs difference in max structual weight. The A-380, at full tanks requires some 20,000 US Gallons more fuel than the B-747-8I to fly essentially the same mission. The A-380 also has a max landing weight some 120,000 lbs higher the the big Boeing, which very costly at mayarports. All this adds up to a much higher per mission operating cost for the A-388 and means it must have higher actual load factor than the B-748. Yes, the per seat cost is lower, but that only matters if you can get revenue paying butts in those seats. Potentially you can make more money with the A-380 compared to the B-748, but you have to fill each one on nearly every mission for the 20 year life span of the A-380 (the B-748 has a 25 year life span). Additionally the A-388 costs some $50M USD more than the B-747-8 at list prices (which airlnes don’t pay). For a 405 seat 747-8 and a 525 seat A380, is the fuel burn per seat the same or is one lower? What’s the empty weight of a 747-8? Given the 525 seat A380, what is an equivalent seat count for a 777-300ER and the A350-1000 at nine across? To bad this awful article is filled with a tremendous amount irrelevant data. Absolutely no one in the business would EVER use ANY of the data you expressed to analyze during purchase contracts. Revenue (which is the only purpose for airlines) is measured in Seat mile. keesje :Good reporting. It amazes me a skilled respected company like Boeing determines this is the right communication strategy. How about preserving Brand credibility. The airlines see these adds too. Well, as there are widely inaccurate numbers floating around, the best place to start are the OEM’s respective manuals for aircraft characteristics and airport planning. Effective main deck floor width on the A380 is 6.3 m, while on the 747-8I it’s 6.08 m.
Effective upper deck floor width between the side storage bins on the A380 is 5.3 m, while on the 747-8I it’s 3.88 m.
Main deck length between the mid points of Doors 1 and 5 is 47.31 m on the A380, while it’s 51.3 m on the 747-8I. Upper deck length of the 747-8I is roughly 18 m (excluding the cockpit, but including the staircase). Main deck length between the mid point of door 5 and the aft pressure bulkhead on the A380 is 1.905 m (equivalent to three fuselage frames with a frame spacing of 0.635 m, or 25 inches), while on the 747-8I it’s 2.54 m (equivalent to 5 fuselage frames with a frame spacing of 0.508 m. or 20 inches). Upper deck length between the mid point of door 4 and the aft pressure bulkhead on the A380 is 6.35 m (equivalent to 10 fuselage frames with a frame spacing of 0.635 m). Main deck length of the 747 between the mid point of door 1 and the forward pressure bulkhead is roughly 8 m.
Main deck length of the A380 between the mid point of door 1 and the elevated front section incorporating the cockpit etc. is 1.27. Upper deck length of the A380 between the mid point of (non existing) door 1 and the avionics bay is 2.54 m.
Effective floor area of the 747-8I is roughly 415 m2. NB: Floor areas of the cockpits are not included. Calculation includes main stairways, but not aft stairway on the A380 as it is enclosed in the aft pressure bulkhead. Calculation takes in to account the tapering of the fuselages. Floor area approximation on the 747.8I between the mid point of door 1 and the forward pressure bulkehead was done by taking the length (8 m); then multiplying it with the effective internal width of the constant fuselage section (6.08 m); and then finally; dividing that number by 2. Thnx OV-099 for working that out. It would mean the A380-800 provides 31% more effective floorspace, while only offering 12% more seats. Using the same cabin standards as Boeing used on the 747-8i, the A380 would have 614 seats. Using Airbus standards, the 747-8i would have 400 seats. Still then, putting A380 economy class seats in the -8i would lead to a 9 abreast cabin. Room for thought regarding the applied “per seat” cost comparisons IMO. LH uses 10 across Y seating on their A-380 lower deck, in a 420 seat cattle car configueration. KE has even few seats for their entire A-380, 405 seats total, and just 301 Y seats, with a duty free shop aboard. Both LH and KE do not offer wi-fi in any seat/suite aboard the A-380. The LH B-747-8I does have it, and KE’s will have it once delivered. So LH uses a 10 across Y “sheep class” configuration on their 747-8i ;-? Advantage of a late EIS for the 8i, the A380 is set to get upgraded soon. But would four engines have helped the BA 777, er, short landing at LHR? The BA38 incident at LHR in Jan 2008 is a case in point in the two or four debate, had the problem occured further from the threshold the answer to your question is quite likely. Actually, no. In that accident the filters for both engines were clogged with ice. In a 4 engined aircraft, the same thing could have happened, it is just less likely that it happen to all 4 engines, but it is possible. Even if “only” 3 engines, the airplane still would not have enough thrust available to prevent that type of accident (even the engines on the accident B-777 were providing some thrust). It may have created an even worse situation because of the assymetric thrust at low airspeeds. My guess: temperature problem is symmetric with just two engines but won’t be symmetric for four engines due to the different attachment points. So engines would have failed at different times with four engines. What the is ad about? I guess just to show each company that each advertising director is worth the money he gets. At the moment Airbus is in the lead. 7Pinocchio7 is great. I suppose it’s also a question of whether each, i.e. every, engine would lose power equally and simultaneously? It becomes clear that if both aircraft carry 450 passengers (100kg/pax+luggage), the 747-8 can carry about 30t of cargo and the A380 can carry about 46t. 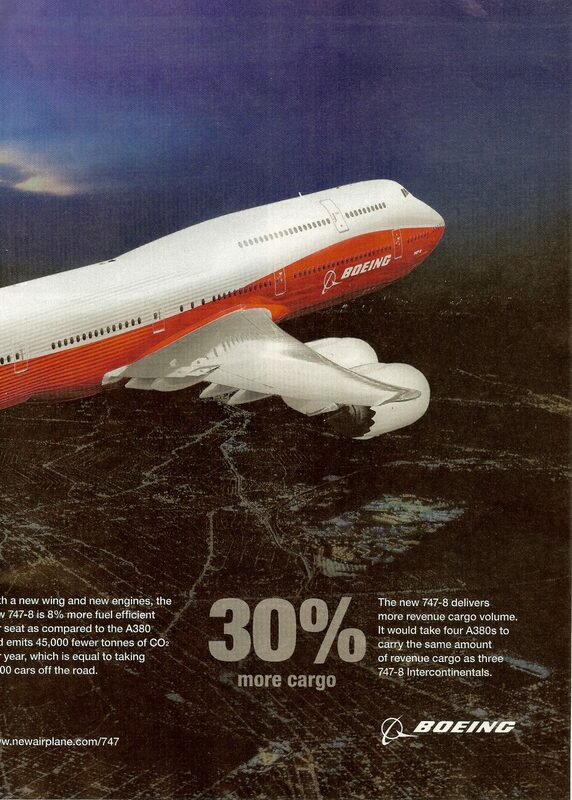 About 50% more then the 747-8, not something I would expect looking at Boeings ad, claiming “30% more cargo”. On this flight the 747-8 would have more cargo volume, but it would be empty volume. MHalblaub :What the is ad about? I guess just to show each company that each advertising director is worth the money he gets. At the moment Airbus is in the lead. 7Pinocchio7 is great. Finally someone addressing this point. I was always wondering why such ads would be placed, if one the airlines pretty well would ignore their content. Finally a “logical” purpose for such ad campaigns. It doesn’t stop at Boeing shareholders. This influences any company in related markets that has to pander to shareholder oppinions. Even if management is not “first order” susceptible to Boeings reality morphs their hands may be forced anyway. Ant note: Nobody spends money on advertising without an effective target vector. Everybody keeps harping on the fact that the A380 needs to be always full. I don’t know any long haul aircraft that is always full. I’ve seen them all at much less than full capacity at one time or another. The pertinent factors to such an issue are: how much revenue are you generating with your premium fare seats and how often are you not running with a full or almost full load. I remember reading some article on the problems the US airlines were facing in the spring/summer of 2001 (yes, they were already in trouble before the September 11 attack). One point that stood out was the revenue generated by premium class seats. Premium class seating accounted for about 15% of the fleets at the time but would generate about 85% of the revenue. Unfortunately I cannot find that article nor do I remember where it was published. My view is the ads are targetted not at the airlines directly, but at small investors (the nasty ones that tends to voice stupid questions) of airlines. By creating such inaccurate ads, both (even if from my opinion its really is Boeing that twist the reality as it fits them) OEM try to manipulate the opinion of those investors. So no, my guess it’s not about the sourcing of the aircraft (both technically and financially), but really only trying to force the airlines to chose their aircraft not to have to explain to those investors why they know what they are doing. I think the “30% more cargo” could be valid, at least when normalized with some number (seats probably). The A380 has not that much cargo volume compared to its passenger capacity, and requires quite a bit for its baggage. However, the B747 needs the special LD1-type ULD for optimum usage of its cargo hold. It loaded with pallets (96×125 inch) as usual practice for cargo and LD3-type ULDs for baggage (standard practice), the B747-8 will mainly have more dead volume to haul around. The B747-8 needs to use LD1 devices to use this volume. The B747-8 has 2.5% more cargo volume. Normalized by the number of seats, the B747-8 enjoys a 15% advantage per seat. The extra 11.6cbm translate into 11% more revenue cargo volume. Per seat, the B747-8 has 24.2% more volume. One way to get to these “30%” is to reduce the density of passenger baggage, hence increase the required volume. Maybe Boeing has better numbers. However, as you can see, the B747-8 will never carry more cargo (in absolute terms), it will just carry more per seat (when normalized with the abitrary and unrealistic seat count of 467). Finally, the B747-8 needs the LD1 container for full utilization of its cargo hold volume, which may or may not be the case depending on the operator. resulting in dedicated cargo carriers offering unbeatable prices. For passenger flights, extra cargo only covers part of the flight costs. Its better then no cargo. Just like cheap tickets. Nothing beats a fleet of stuffed, 20 yr old, paid for 744s making fuel stops in a Anchorage or Krasnojarsk.. Cargo is an important additional revenue on many routes. Still, it usually doesn’t motivate the purchase of an aircraft. I don’t how much margin it generates. I would think that it is more important when flying to remote airports with limited widebody traffic. Emirates B777-300 are always pretty fully loaded when flying into Hamburg. It is quite interesting how Airbus creates a buzz on the 747-8. 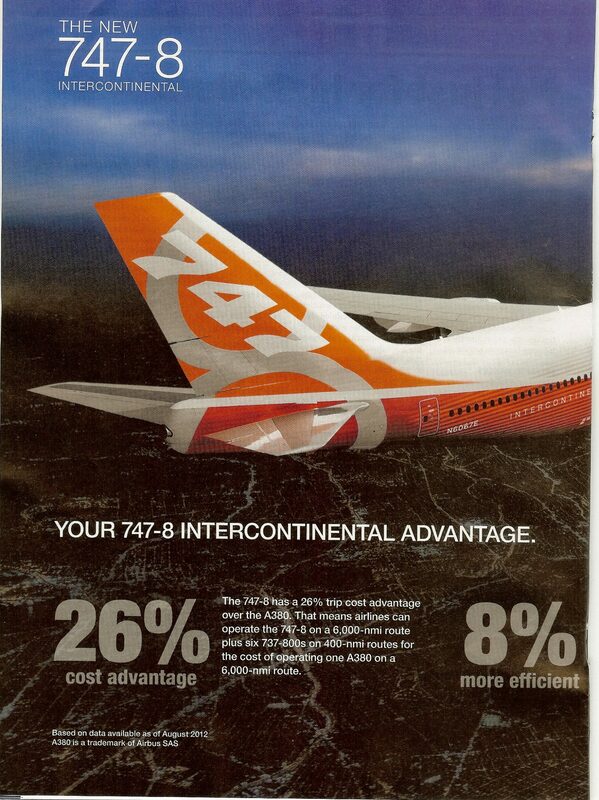 Since the 747-8I has garnered such a formidable market share, perhaps that’s why Airbus is “concerned”, right? But of course, in Verovenialand where “everything” Airbus is seemingly in dire straits, it’s only logical that Airbus would create a “buzz” about the 747-8. Yes. I just do not see any reason why Airbus should be concerned by the 747-8 Intercontinental because it is not even in the same market as the A380’s. Airbus should not even bother about the 747-8i even if Boeing publishes comparison between the 747-8i and A380. Who cares? It must be there are some VLA sales campaigns ongoing and A felt it had to respond to the Boeing claims. UA, DL, CX, CA, ANA, Turkish, LH and Garuda come to mind. 747-800 is the best plane in the world!!!!!!!!!!!!!!!!!!!!!!!!!!!!!!!!!!!!! !